Your company’s swag needs to be on trend, in context, and relevant to your clients. Because today, simply adding a logo to your favorite products no longer qualifies as a thoughtful giveaway. Looking to drive more business to your brand and thinking about using promotional items? Well, you have come to the right place. Yes, we are a little biased as promotional business swag is what we do for a living. However, we will show you some independent industry statistics that prove they really work. Overall, using business promotional products is the most inexpensive form of advertising. It is cheaper than newspapers, online advertising, and even radio and television. By putting your brand in front of thousands of people, you have the potential to earn new leads as well as retain current customers (for less than a penny per impression). So how exactly can promotional items help drive business your way? To understand why business swag can help drive more business, it is important to know how promotional items work in a marketing environment. The number of impressions basically means the number of times people will see your brand. It is used as a metric to help determine your return on investment, similar to ad impressions or “cost-per-click” for online advertising. Based on the cost of each item, you will pay less than a penny for each impression you receive. For some items, such as promotional pens, your cost is as low as 1/10th of a penny per impression. 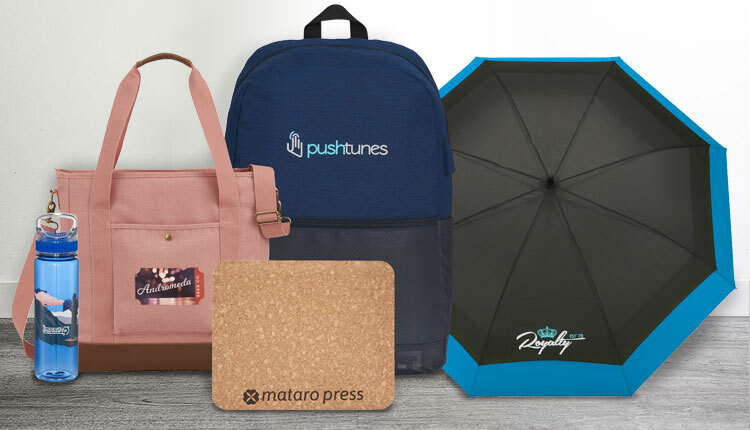 With other forms of advertising such as newspapers (3.2 cents per impression) and online advertising (1.0 cent per impression), promotional swag is the least expensive way to get your brand in front of people. Its one thing to get impressions, but do they really work? After all, you can get millions of impressions but if they don’t convert into customers you are wasting your money. Well, according to the Promotional Products Association International (PPAI), promotional products are the number one most effective form of advertising. This takes into account broadcast, online, print, and mobile advertising. It also includes all target audiences from the Silent Generation through Millennials. 7 out of 10 brands say that they achieve their overall marketing goals with promotional products. 89% of people have received a promotional product within the last six months (meaning your competition is using this form of marketing heavily). Out of everyone who receive a promotional product, 79% do research on the brand while 83% are more likely to do business with them. 7 out of 10 people remember the call to action of a brand when receiving a promotional item. 8 out of 10 people recall a brand’s message when receiving a promotional item. 9 out of 10 people recall the branding when receiving a promotional product. If you still don’t think you can increase business with some of your best company swag, keep in mind that everyone else is using it. Look at your own household and see how many promotional items you have from others. If this type of marketing did not work, people wouldn’t be using it. Of course, getting the most for your money all depends on how you use it. So now lets talk about some of the best ways to effectively use some of these business promotional products. It all comes down to how you market yourself. You have to plan in advance and cannot simply buy products and give them away expecting a big return. Just like all other forms of marketing, you have to keep your potential customer in mind. For promotional products, the number one reason people keep them is because of their usefulness. That is why it is important to understand your customers and what items they will likely use. For instance, if you are a gym or fitness facility, some of the best promotional items would include gym towels or water bottles. Giving away stress balls at the gym wouldn’t be that effective. In addition to choosing a useful product, you must also ensure that your brand is properly represented. If you have a larger message, chose a product with a larger surface area such as a custom umbrella. Personalize your message with something like a custom message on a golf ball marker. Finally, you can always co-brand with a major manufacturer to help give more clout to your own business. For instance, put your logo on a custom Nike hat or an ever-popular Yeti Cooler. Doing so will help bring more credibility to your brand than doing it on your own. Now that you know they work and how to choose the best items, how do you go about using business swag? Some people think you simply give out swag and people will come. While this does work, the most effective way is to use items for giveaways. When you run a giveaway, this gives you an opportunity to collect contact information such as phone numbers and email addresses. Once you have these, you have a full list of potential leads that you can work from. In addition to giveaways, you need to target specific audiences for your business. For instance, if you sell insurance, it would be beneficial to target consumers who are purchasing homes or cars. You also don’t want to give away things like golf balls to people who don’t play the game. This is a waste of money and won’t do you any good on obtaining new customers. You can also use certain items to give away to first time customers or when someone signs up for your rewards program. Ever signed up for a player’s card at a casino? Chances are they gave you some swag when you did. Earning new business is expensive. As such, you should also use promotional items to retain current customers. Yes, retaining customers is cheaper than earning new ones. As such, you need to concentrate a portion of your marketing efforts on this target group. Rewarding your customers with your best business swag is a great way to keep them coming back. Give items away as rewards for customers who spend a large amount of money. Or, give them away on customer appreciation days or just because (unexpected gift at an unexpected time). Customers can also be your best brand ambassadors. For those who are loyal and like your product, you need to take advantage of their loyalty by letting them wear your business swag. Business promotional items such as hats and shirts worn by your customers can spread the word about your brand. Not only will you gain valuable brand impressions, you will also likely get a referral from them. Speaking of referrals, this is another way you can use business promotional products to earn more business. In addition to using business swag to drive more business with current and potential customers, you need to use them to thank your referrals. People who make referrals to your business are a lifeline. They send people who otherwise may have never sought you out (or even purchased from your competitor). When a referral receives thanks from you, they are more likely to pay you back with more referrals. Remember that referrals cost you absolutely nothing so put a little money into thanking those who bring you business. So, the statistics don’t lie. Most brands say that using business promotional items in their marketing campaigns is effective. The majority of people receiving products also have a favorable opinion of the brand and are more likely to do business with them. Employing your best business swag can be effective if you do it right. Target customers with useful products and don’t forget to thank your current customers and referrals. If you are on a specific budget or undecided on what items to use, give one of our promotional product specialists a call to assist.